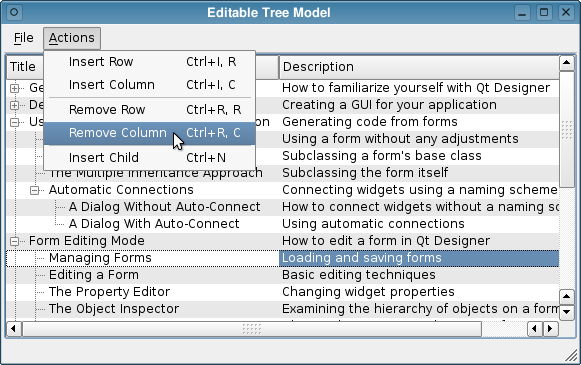 Qt provides a lot of capabalities to display pre- and user-defined item models in different ways. The separation of functionality introduced by the model/view architecture gives developers greater flexibility to customize the presentation of items. The address book example shows how to use proxy models to display different views onto data from a single model. The Basic Sort/Filter Model example illustrates how to use QSortFilterProxyModel to perform basic sorting and filtering. The Combo Widget Mapper example shows how to use a custom delegate to map information from a model to specific widgets on a form. The Fetch More example shows how two add items to an item view model on demand. This example demonstrates how to freeze a column within a QTableView. This example demonstrates the usage of the model/view framework. The Simple Widget Mapper example shows how to use a widget mapper to display data from a model in a collection of widgets.